Many times when we discuss our Energy Sentry Demand Management Systems we focus on how they are used for demand rates. However, the Energy Sentry systems have also been used for years in areas like Arizona for Energy Time-of-Use (TOU) rates. 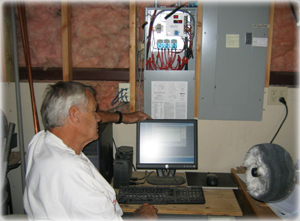 Some of our residential customer's in Colorado have also utilized Energy TOU to save on their electric bills. Here's one customer's story. In 2004, Tom Harr decided to build an all-electric home in the mountains of Loveland, CO. This was unheard of at the time considering most homes in the area are heated by propane. 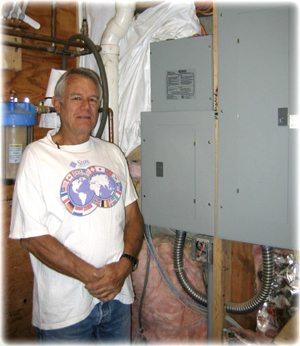 Tom is a retired electrical engineer who has taken great interest in green energy and sustainability. Due to this interest, he decided to design and build his new home to be as energy efficient as possible while cutting down on his electric costs. His power supplier, Poudre Valley REA, has a Time-of-Use (TOU) rate for residential homes, and Tom wanted to capitalize on this to increase cost savings. He contacted Brayden Automation about their Energy Sentry 9388A demand management system. Tom's unit is set to limit the number of kWh's that can be used during on-peak periods, and this moves the majority of his energy consumption to off-peak periods. By doing this he is able to utilize Poudre Valley REA's TOU rate and save hundreds on his electric bills every year. The remarkable part of Tom's story is how much he saves by utilizing the TOU rate with an all-electric home. In the past three years Tom has saved a total of $2,865 — that is an average of $955 per year — almost $1,000 per year by using the 9388A. Tom spends $2,400 a year on his electric bills. This includes his 4,600 sq. ft. house, 2,100 sq. ft. shop, and a hot tub that is used daily. According to Poudre Valley REA's website, a "typical" 2,000 sq. ft. home heated by natural gas costs $2,994 and one heated by electricity costs $3,850 per year. Tom has over three times the amount of square footage and pays much less than both the "typical" natural gas and uncontrolled electric homes. By using the 9388A Tom has cut his electric bills by almost a third. "The real beauty of the Brayden system is this software... I can see where the power is used and at precisely what time and for how long." Tom recently commented on his savings: "My wife and I are really happy and comfortable living here in the mountains. When I speak with some of my neighbors, and they tell me that they just paid for yet another tank of propane and that their yearly energy bills are in the $4K range, I just keep quiet and say to myself, YES! My yearly bills for everything are in the range of $2,400. YES! And when talking to these same neighbors, my square footage is much larger than what they are heating." Tom also incorporates EnergyAccess into his energy saving system. He goes on to tell how invaluable this software has been: "This software records all electricity data on a 24 hour basis, and I can save, print and copy to another location, computer, or storage device from this computer, using my LAN. The real beauty of the Brayden system is this software, and by looking and analyzing the data, and how my loads were distributed within the 24 hour period, I can see where the power is used and at precisely what time and for how long. I use this data to analyze my load system, and by changing loads/times, I am able to keep my usage within the boundaries I have established. Again, this graphical data is invaluable in analyzing what my system is doing!!! And without this data, I would be flying blind..."
It's great to see that Energy Sentry products are so versatile and can be used for Demand, Demand TOU and Energy TOU, and provide our customers with long-term savings!